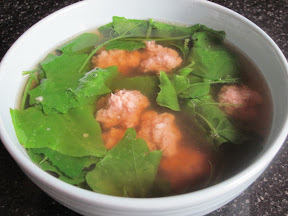 This is one of the simple soups and very well loved among Thai families. Mostly because of Gourd Ivy’s Vitamins and the not-bitter taste of the green leaves that the children love. To have the fresh vegetable still nicely green, I add the hot boiling soup on top of gourd ivy leave bowl just before serving. 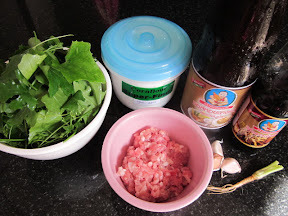 Add the mince pork in a bowl, add the chopped garlic, flour, pepper, oyster sauce and soya sauce together and mix all well. Boil coriander root with 3 cups of water and oyster sauce. When the water is boiling make small meat ball from the mixed mince pork and add into boiling water. When all the meat is cooked they will surface the boiling water. Season with Soya Sauce, until you get the taste you prefer. On serving, add the clean fresh gourd ivy leaves on the soup bowl and pour the hot soup over.